Occupy Wall Street and the Tea Party: Do they agree on anything? The thinking behind the news. One looks cooler. The other smells better. Do they agree on anything? The Tea Party movement began on Feb. 19, 2009, when Rick Santelli, the CNBC financial journalist who reports from the floor of the Chicago Mercantile Exchange, ranted against the government bailing out homeowners who couldn’t pay their mortgages. The Occupy Wall Street protest got going two and a half years later, when editors at the anti-corporate Canadian magazine Adbusters were inspired by events in the Middle East to call for a mass demonstration against the financial industry on Sept. 19, 2011. Those origins tell you a lot about how the two movements differ. The Tea Party has remained a purely American affair, while Occupy Wall Street strikes a global posture. The Tea Party began spontaneously, when a guy on TV got mad about freeloaders. Occupy Wall Street was planned over email by experienced organizers. The Tea Party is a revolt of the haves; Occupy Wall Street a revolt of the have-nots. Yet there are points of commonality between them. Both are angry about what they see as economic unfairness—the Tea Party over deviations from free-market principle, the Occupiers over excessive adherence to it. Both are hostile toward society’s elite, though they define that elite differently. Both are frustrated with the American political system. Let’s go a little deeper into the comparison. Grass-roots authenticity: Critics of the Tea Party have been quick to point out the ways in which it has been driven from above. Fox News used its megaphone to hype and encourage the Tax Day protests that were the Tea Party’s first big outing. Its personalities Glenn Beck and Sarah Palin became darlings of the movement. Wealthy conservatives like the Koch Brothers bankrolled the Tea Party while Republican politicians tumbled over each other to glom on. It’s hard to see a parallel here to Occupy Wall Street, which has no major media champion or institutional support. Reuters published a weak story today attempting to link the liberal financier George Soros to the movement though a tenuous connection between his Open Society Institute, a San Francisco non-profit, and Adbusters. But Soros says he’s never heard of Adbusters and Adbusters says it hasn’t received money from Soros. Labor leaders want in, but so far haven’t had much impact on the protests. Message coherence: At this point, it is pretty clear what the Tea Party view of the world is: smaller government, lower taxes, less spending, and less regulation. One can’t say the same about Occupy Wall Street, which raises a wide variety of complaints: Bankers should be punished; they should be paid less; government should regulate them more aggressively; society is becoming more unequal; people are out of work; money should have no sway in politics; capitalism isn’t working; etc. But Occupy Wall Street is less than a month old, and at a similar point in its emergence, it was much harder to say what the Tea Party stood for beyond “freedom” and the Constitution. OWS leaders, such as they are, have promised that more specific demands will emerge. The problem is that many of the Occupiers’ most trenchant complaints, like excessive pay for CEOs, don’t translate readily into a political program. Impact: The energy generated by the Tea Party helped produce the big Republican swing in the 2010 election. But the influence of the Tea Party within the GOP also led to the nomination of unelectable candidates who arguably cost Republicans the Senate. Probably the Tea Party’s greatest achievement to date is keeping House Speaker John Boehner from agreeing to a debt-ceiling deal with President Obama that would have included a modest tax increase. Overall, the movement has made the Republican Party more rigidly right-wing without producing any substantive accomplishments. Its influence may now be on the wane. The GOP seems poised to nominate a candidate the Tea Party doesn’t like. Occupy Wall Street is probably at an earlier stage of its lifecycle, but already pointed toward a similar role: energizing the liberal base and pulling the Democratic Party to the left, without making anything in particular happen. Style: Where the Tea Party is anarchic in principle and conservative in style, Occupy Wall Street is anarchic in style and liberal in principle. Tea Party rallies are dominated by middle-class, middle-aged white men who pack up their coolers and go home at the end of the day. The Occupy Wall Street encampment, which I visited a couple of times last week, is more like a Phish concert that forgot to end. The Tea Party, remember, was launched by a guy in a suit on the floor of a financial exchange; it’s the backward-looking movement of people worried about losing their place in society. Occupy Wall Street was spawned by a poster of a ballerina perched atop Wall Street’s bronze bull. It is the image-conscious, forward-looking movement of people worried that they may never live in the kind of country they want. Occupy Wall Street looks cooler. The Tea Party smells better. Structure and Tactics: The Tea Party has evolved toward a hierarchical decision-making structure; OWS insists on a horizontal, consensus-driven one. Both movements are nonviolent, with deviations. Tea Partiers created an ugly scene at the Capitol last year and were accused of using racial epithets and spitting at members of Congress. OWS protestors have come into conflict with the police, and been criticized for creating squalor and nuisance in Lower Manhattan. Their tactics include civil disobedience, confrontation with authority, and a willingness to get arrested—something Tea Partiers aren’t interested in doing. This has already proved effective at drawing attention and sympathy. An episode of brutality by a New York City police officer with a can of pepper spray greatly expanded the profile of protests. 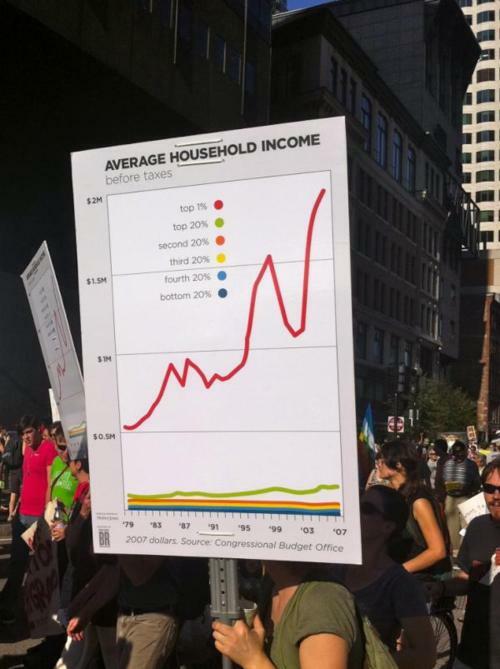 Guess whether the person in the slides that follow is participating in an Occupy Wall Street or a Tea Party rally. Answers to each image are on the following slide. The answer to the previous slide: Occupy Wall Street. There is not much that the Tea Party and the Occupy Wall Street agree about other than that they are not like each other. Because of their huge cultural and ideological differences, both groups object to the comparison. But as spontaneous, unpredictable movements reshaping the political landscape, they have more in common than meets the eye. The parallels are much stronger than either prefers to admit.